I had been fascinated by the Northern Heights branch for years - even the name suggested something special, something rather European perhaps? I'd pored over maps of the abandoned line, and viewed endless images of the route - both in it's heyday and afterwards. It was a surprising story in some ways - many surprising London Transport projects have progressed to fruition despite their costs or complexity. But this one - to take a branch of the joint GNR/LNER leading to the terminus at Alexandra Palace and incorporate it into the line to Moorgate - was scuppered early on. The branch benefited from a steam service to Kings Cross and North Woolwich between the wars, and despite a decline in ridership, the chance of decanting brokers and businessmen from the increasingly salubrious suburbs of Crouch End and Muswell Hill directly to the city was surely a winner? Work began, the ironwork to support the electric cables was erected, conductor rails laid - the line curved south and west from the Palace, linking to the Underground at Highgate where a substantial surface station remains even now, then turned east towards Finsbury Park, flying over the mainline station and descending to join the branch to Moorgate. Then war broke out and the project was mothballed. Steam services rather surprisingly began again in 1945 - but in a half-hearted fashion. Coal shortages followed, the branch was cut back to a shuttle service to Finsbury Park, and eventually closed in the 1950s. The rails remained in some sections until the 1970s to facilitate the transfer of Underground stock between lines, and it's perhaps this which prevented the land being annexed by developers early on. 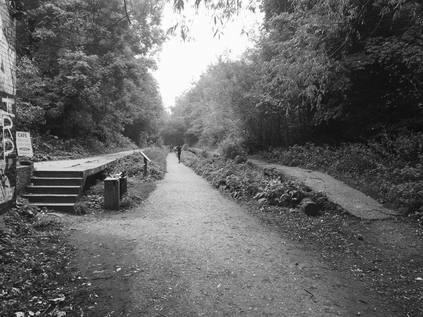 By the 1980s the campaign to preserve green spaces was more vocal, and much of the line became The Parkland Walk, reputedly London's longest park. The wooded margins of the line were left to grow around the well-intentioned signs erected to encourage pedestrians. By the time I began my curious interest in the Northern Heights it was a green snake in the suburbs, a curious absence on the map which, to perhaps only the trained and curious eye, denoted a former railway alignment. I found myself at a misty Alexandra Palace station, buying a coffee from a busy cafe/flower shop combination called The Yard. Outside, visibility was down to a few metres and the suburbs were wearily recovering from their Saturday morning hangover. I crossed the footbridge and set out towards the Palace. Seeing a track leading down into the park, I set off. The path was besieged by joggers and dog-walkers who, it seemed, weren't entirely comfortable with each other's presence at all. I saw a number of minor altercations as dogs decided that the heavy-breathing runners decked out in their serious lycra wanted to play and irritated owners hauled their panting companions off. However, both the joggers and the dog-walkers could unite when it came to cyclists, who were a common enemy. No-one rang a bell out here in the suburbs, they felt their entitlement strongly and weaved crazily around obstacles - human or canine. It was during the fascinated watching of this minor conflict that I realised I'd already taken a wrong turn. 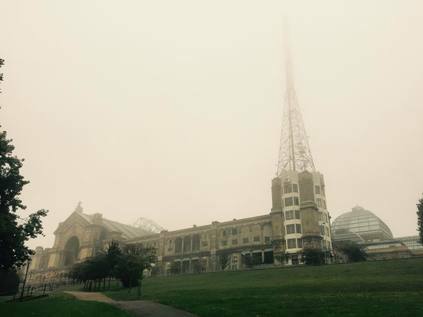 Looking up the steep rise to my right, I could see the vast antenna of Alexandra Palace rising from the building, disappearing into cloud. I turned for the building, realising that this walk would feature something absent from my usually water-based wanders - hills. I slogged up the bank, dodging impromptu streams which trickled down the slope, my hip complaining and out of breath. I felt completely out of shape and out of practice as I met a gent on a single crutch hobbling down the steps from the Palace. He chatted amiably about his walk, how he had used the crutch for so long he thought he'd forgotten how to walk without it. I felt ashamed of my groaning at the hill. Moving on, I skirted the front of the Palace building. Still an active venue, the place is in a range of states - some parts looking fit to collapse at any moment, while the grand hall could still be in its prime, with only the more cosmopolitan tastes reflected in the closed-up Sushi and Thai food concessions around the hall's perimeter giving away the century. The grand Palm Court entrance gave way onto a yard, now full of hospitality tents. I poked my camera into windows and tried to get a sense of what was inside, but the building was resolutely closed today. I set off, down hill and westwards, trying to gain the path of the railway which emerged from a now abandoned but still extant station at the north of the Palace site. Briefly the line was clear in the level course of a path between trees, but it was interrupted by a fenced entrance to a Health Club. I headed across the curve of the Palace driveway, emerging into Alexandra Park. I tried to remain faithful to the railway, skirting the northern edge where I could as the path snaked around a little café which seemed well-patronised despite the gloom and mist, mostly by cyclists, resting their steaming lycra. The path regained the railway alignment here, disappearing under the road at what was clearly once a bridge now filled-in to offer a typically narrow urban underpass. Above was Muswell Hill - where I'd had a vague plan to start this walk before deciding to extend east to Alexandra Palace. I didn't feel any need to explore the area - there was a path to walk ahead, with the first taste of railway arcana evident in the presence of some of the iron railings which would have supported the electricity supply cables which never quite made it this far. This first section of the Parkland Walk (North) as designated by the London Borough Haringey takes in the broad sweep west which the line took to reach Cranley Gardens station. Curving high above the suburbs on a broad brick arch, the views to the south are said to be noteworthy. Today however, the valley was a sump of cloud with only some relatively nearby modern office blocks peeking through the carpet of white. Looking north, the spire of St. James Church loomed ominously among the redbrick villas of Muswell Hill. I walked on, still dodging joggers and cyclists. I revisited my casual survey of cyclists use of bells - on the towpaths in the east a merry ding was fairly common to warn of a passing hazard, but north and west of the city a reluctant grunt was more likely. Those passing today did nothing to buck the stereotype. As the path began to turn south, the trees closed into a tunnel overhead and I was reminded that this wooded slope down to the Thames had been forest until relatively recent times, and this quiet path had quickly reverted to type once the railway was taken up. Rather suddenly, the path opened out to reveal a brick overbridge, the hum of traffic drifting down to the path signifying a fairly busy road. Passing under the bridge, the footpath forced an ascent back to road level. The trackbed immediately east was built on, blocked before it swung around the edge of Highgate Wood. At street level now I had a choice - the suburban delights of Muswell Hill Road or a walk through the woods. Perusing the notice and map at the gate sealed the deal - at the heart of the woods was a café and toilet combination - beloved of Local Authorities everywhere, and so often closed - but it was worth a punt. I set off into the deep, mossy woodland of ancient trees. Quiet descended immediately, and voices travelled eerily far within the woods. I heard a distant group of children playing before I saw them, and could hear - but not understand - every word of a 'phone conversation of a French woman on a bench a fair distance away, as she smoked herself into a lazy stereotype. I plunged into the heart of the park, circling the Corporation of London facilities until I found the wonderfully spick and span Gents toilet. Much relieved I headed back out to the edge of the park which skirted the road. My instinct had been to hug the curve of the railway but the sign was clear "Abandoned Railway - No Public Access". Instead I headed for the point where the road converged with the former railway at Highgate Station. The walk was cool and pleasant - an antidote to the close, misty fug outside the woods. I enjoyed the strange sense impressions of being in woodland within a city for a while before I found myself at a convenient exit onto Muswell Hill Road. The road curved slightly uphill here, and a queer little block of haphazard white cottages filled a gap in the otherwise deeply typical North London street scene. The centre cottage had a blue plaque reminding passers that Peter Sellers had lived here as a boy. In fairness, he hadn't stuck around long - and after finding early success he'd headed uphill and upscale to nearby Highgate - but it was a sobering reminder that these properties which now shift for well over half-a-million were fairly humble in origin. A little way on, a confusing mess of traffic lights and pedestrian crossings signals Highgate - or at least a stretch of the A1 which is not quite Highgate and not quite Archway. A mixture of low-aspiration chicken shops and higher-spec bars, the area seems a little confused and transient. Highgate Station is a strange anomaly - one of the deepest tube stations on the network, topped by a fairly extensive and surprisingly intact surface station which used to serve the Northern Heights line. There are a couple of reasons for its survival - firstly, its a fairly solid concrete structure which is integral to the sub-surface part of the station, and secondly even the parts of the station above the ground are nestled at the foot of a deep chasm here. Access to the ticket hall for the underground is via steps or escalator from street level to a concourse immediately below the former surface station with one of the small car park areas overlooking the former platform canopies. Thousands of people catch a glimpse of the former station as they pass each day, and I wonder if any of them ponder the history of the place? I'd like to dwell on the station a little, get a good picture perhaps - but it's evident that this is going to be a frustrating exercise. The site is closed off and the official routes busy with people. The station is just inaccessible enough to be tantalising. Instead I walk a little way along the street to get a drink at a newsagent, before turning back and dodging into a side street - it was time to find Parkland Walk (South). The southern section of the linear park is remarkably similar to the first, if a little longer and more regularly crossed by other routes. As the line descended the slope from Highgate towards Finsbury Park, it curved eastwards, cutting across Crouch End where the station platforms remained intact. I decided to walk along one of these long abandoned platforms - the route was still busy, and it would at least get me out of the path of the cyclists for a time. Hemmed in by trees, it was quiet and oddly rural here, while over the embankment the suburbs were beginning to turn into the perma-highstreet of outer London radial routes, with their endless fried chicken shops and encroaching Tesco Metro branches. Here though, all was green and still. I paused a moment to regard a carving of a woodland spirit or Spriggan, clambering menacingly down from a brick arch. Perhaps this sylvan guardian keeps the real world at bay in this little nook? Beyond the station, the line crosses a multilayered intersection at Stroud Green - beneath it the suburban Stapleton Hall Road, and further beneath that the Gospel Oak to Barking Line, ploughing east towards Harringay Green Lanes, with the tight curve onto the East Coast Mainline evident in the near distance. This is a signal that I've almost completed a circle now, and I move on towards Finsbury Park. Here the parkland walk ends rather inauspiciously in fact. No metal archways like the Greenway or Ridgeway, just a choice - a slope down to the road or through a kissing-gate and onto the blue metal bridge over the railway which I'd spied earlier. I took the bridge which deposited me at the edge of Finsbury Park - and I realised I'd never been here. Well, I'd been to the place called Finsbury Park, and indeed the station which borrowed its name - but I'd never visited the park save for a bus journey skirting the eastern edge. With the pathways uncertain, I struck east and tried to cross the unfamiliar park. The way was blocked by a playground and a lodge, converted into a closed art exhibit, but I finally found myself cresting the rise and crossing a wide expanse of open grass towards the road. Now I was at a point of decision. My entire purpose today had been to walk the Northern Heights line - it was a walk I'd long set-aside, and it felt good to have done it. But what would I write about? What would be the defining theme or moment to my walk? I realised that - despite most of my ramblings being mere descriptive text, they all had a hook. This had none of that - it was a pleasant suburban walk which echoed the same experience of all of those joggers and cyclists. There was nothing special about a trudge along a North London footpath, was there? Feeling a little dejected I plunged into deeper suburbia, and with it, the London Borough of Hackney. Woodberry Down was, it turned out, the subject of one of the largest and most expensive regeneration plans in Western Europe. I'd stumbled into a zone which had been marked out for what was unflatteringly described by some as state sponsored gentrification. Like many such areas, its history was noble - a model social housing scheme conceived to alleviate slum living and built to a relatively high standard for its time. The mix of low-rise housing and mid-rise, typical local authority blocks clustered around the river and the reservoirs, nestled in a curiously quiet nook of north west Hackney, far from the bustle of its traditional centre. In fact, it was quite a way from anywhere - and despite the presence of Manor House station on the edge of the zone, it was always somehow disconnected and separate. The social and political consequences of placing a vast swathe of public housing here - no less than 2000 homes at its zenith - were not important. The need was clear, so the job was done - houses built for those in need to Herbert Morrison's masterplan: taking land formerly inhabited by sprawling suburban mansions and dedicating it to public use. The inverse of gentrification perhaps? The story is familiar from there on - the London County Council is abolished, an impoverished and corrupt Borough neglects its duties, the estate becomes an ill-maintained sink of unlettable properties, its population an uneasy mix of long-term local residents and transient people from across the borough desperately in need of housing. The social problems escalate in inverse proportion to the decline of the fabric. By the 1980s, Woodberry Down was infamous and mostly unvisited. Its spiralling drug problems marginally troubled the Police, but largely prevented their intervention in local affairs. The blocks crumbled around the loyal residents who clung on, part of a community if nothing else. The cry that 'something had to be done' turned into a long-term vision which saw Hackney's councillors ride the wave of private capital which was sweeping the City. The stock sold, a developer and housing association engaged, a masterplan for a long, slow redevelopment of the area proposed in attractive but hazily provisional drawings. The worst blocks would be replaced first, the residents decanted and replaced in like-for-like social housing 'units', but some blocks would be sold commercially to provide a return on the investment. It was a commercial and political win-win. The program started a slow march through Woodberry Down. There were delays and changes, of course - it was a hugely complex task - but the changes soon took on a worryingly familiar theme. Suddenly, the commercial blocks were promoted in the running order, and those nearest the waterfront were redesignated to be sold rather than let. The river's edge walk I'd just made along the brochure-friendly sweep of glass and granite blocks was meant for overseas investors, not the locals. 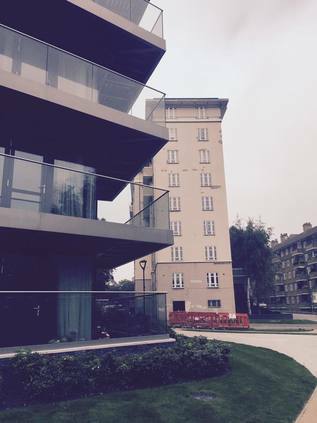 In the large tower fronted by the water feature, upper floor apartments sold for £1.3m. This was now private land, compulsorily taken, given back to the public, now retaken to be sold to let. Regentrification. A real-estate soap opera. A little way along the river path, it abruptly ends at the foot of the last refurbished block so far. Large slabs of crumbling apartments with boarded windows march east, backs to the new builds, the neat pathway giving way to a sandy, rutted track. A couple bump a pram along the grooves heading for home. This is the real Woodberry Down - or at least what is left after the carrion has been picked over by the developer. At this point I felt a little ashamed - I'd been hammering on about events east of here for years, and in housing terms at least, the Olympic scam was a perfect microcosm of this issue at work. Here though, many thousands of people's lives were being changed by a grand scheme dedicated to offshoring maximum profit. The people I felt perhaps most empathy with were those who hadn't yet had the developer's eye turned on them - they waited. It could be three more years, or it could be never. The promise of a decent home, underwritten by Hackney Council, supported by the sale of the private elements of the scheme seemed more like a gamble with uncertain odds. I was beginning to feel footsore when I found my way onto Amhurst Park and started the turn southwards towards more familiar ground. The mist had begun to lift a little and there was a weak but warm sun breaking through as I passed over the railway line at Stamford Hill. 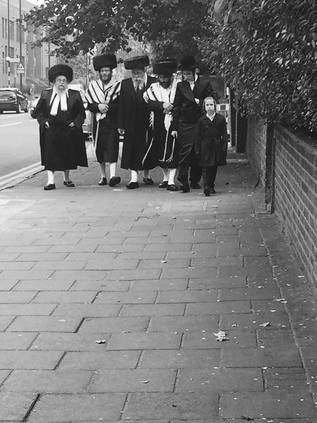 Groups of Hasidic men wandered home in shtreimel and rekel, talking and gesturing with varying degrees of merriment and seriousness as they went. The street was busy with life, which was a relief after the near silence of Woodberry Park. At the busy meeting of ways at the centre of Stamford Hill I turned south onto the A10 - the long, straight drag leading directly into the city. It was dry and dusty, crowds of shoppers waiting for delayed buses, casual anti-semitism uttered on sour, lagered breath. I needed to be near water to complete my walk, and I felt the pull of the River Lea again - the marine parallel of this dreary road south. After pausing outside the gates of Abney Park Cemetary to rest my feet, I turned east, staggering my progress via suburban streets and narrowly avoiding Kray connections on Evering Road. If this was gangland, it was curiously quiet and leafy today with no hint of menace behind the net curtains and CND stickers in the windows. My next encounter with civilisation was at Clapton, zig-zagging across Upper Clapton Road to dive through the Southwold estate to the river. Again, I recalled the reputation of this long, southbound main street - once the fringe of Hackney's 'murder mile' but now bookended by gentrification - there was more chance of taking a NutriBullet in Clapton now. The sun was at an afternoon high as I began the gentle descent to the river. The owners of the small, provisional and oddly half-empty corner-shops of Southwold Road were out front, enjoying the hazy warmth. Kids played in the street noisily. Occasional raised voices leaked from inside quiet homes. At the foot of the hill the street opens into Millfields Park with direct access to the Lea. Despite being tired and sore, I picked up the pace, eager to reach the water. I realised though that something had changed. The horizon was unfamiliar - the flat, empty bulge of Essex Wharf across the water now home to more of the anodyne apartment blocks which are appearing all along the river. These seemed very new - beginning to be inhabited, but surrounded by unmade ground with exposed pipes and builders detritus. I snapped a picture to compare with my 2012 view as cyclists dinged by. I had been away from this path for far too long it seemed. My walk south was essentially a reversal of a long-ago excursion made just weeks after the Olympics ended. The world here is different now - but not wholly. Crossing the Lea Navigation just south of Lea Bridge Weir, I pass the entrance to the Middlesex Filter Beds - still quiet and green, still a monument to long-gone municipalism. My legs feel like stone, and I plot several escapes via bridges and bus stops - but none of them really appeal. I want to unwind this walk all the way to Bow Church. As I pass the now unfenced edges of the Olympic Park I notice they are still officially closed while planting takes place. Some of this land has been inaccessible for a decade now I noted as I skirted the 'soon to open' Here East buildings - fronted by the former the IBC/MPC block. Oddly, once I've passed the stadium at Old Ford Lock the towpath feels unchanged. Still overhung by trees and collapsing warehouses, paving slabs still clunking underfoot. The cement works looms over the path and there is little to give away what has happened here over the last ten years - except for one tiny hint in some graffiti on a crumbling brick workshop which somehow has survived: "ODC Domain". I clamber up the bridge at Bow Roundabout, tempted to press on under the junction via an yet-to-be-walked sliver of towpath - but it's now a little late in the afternoon, and I'm incapable of taking more than tiny steps ahead. My knees are locked tight and my hips hum with a vague but persistent pain. I've walked well over twelve miles - and somehow in the midst of terrain I feared would be faceless, anodyne and suburban I found both anger and inspiration. Trying to describe this feeling, the sense of dismay at lost opportunities and the flash of anger at the greed and stupidity of local politics I recall the words of Iain Nairn, standing in a ruined Lancashire pulpit: "It makes me BURN".